On the last date of her European tour, Queen Kwong returned to Manchester for a headline slot at the Night And Day. 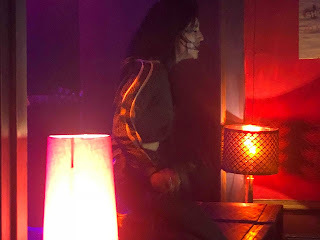 With a critically acclaimed album Love Me To Death under her belt and The Pearl Harts in tow as part of her band, she delivered a thirty five minute set of stunning intensity that cut through the sauna-like conditions of the venue. 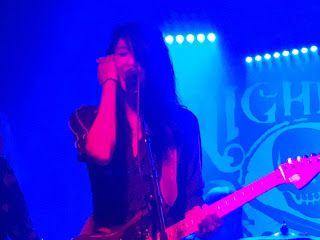 From a five-minute instrumental opening salvo of Prehistoric Blues through to the last couple of minutes alone on stage controlling guitar feedback by standing on a set of pedals, Queen Kwong, aka Carré Callaway, is on a mission. Last time she was in Manchester at Sound Control in December 2015, pretty much everything that could go wrong for her did. Tonight she's still here and Sound Control is no longer. Tonight is about raw power, channeling inner energy into a performance that dances along a tightrope between chaos and breakdown, loud guitars, to the point of distortion, to the point of almost obliterating the vocals, then dropping to reveal a raw exposed side to songs from both Love Me To Death and its predecessor Get Me A Witness. Whether with guitar in hand, or crouched down on the boxes that demarcate stage and audience at the Night And Day with tambourine in hand seeking out eye contact with those at front, or smashing her microphone into cymbals as she lets loose, all eyes are fixed on Carré. Songs like The Happiest Place and Bells On are transformed from their records into mutated multi-headed venomous versions of themselves that leave the audience open-mouthed and as exhausted and invested in the performance as the four of them on stage. It is very much about the art of the performance as it is the music, the two colliding headlong and not just surviving, but bonding together to intensify the impact. That the band leave the stage one by one at the end, abandoning their equipment whilst Carré controls the guitar feedback with her feet for minutes sums up a performance that doesn't even acknowledge the existence of the rule book let alone even try to follow it. Queen Kwong's website can be found here. She is also on Facebook and Twitter.